On Tuesday, Turkish warplanes held a barrage of flyovers over the Aegean Sea, in some cases flying over Greece’s airspace. The flyovers are in revenge for the release of the last four of eight military servicemen into protective custody. Since the aborted coup attempt on Turkey on July 16, 2016, Turkey has been demanding the extradition of eight Turkish soldiers who fled to northern Greece after the coup. The eight soldiers – including two commanders, four captains, and two sergeants – had escaped to Greece on a Sikorsky helicopter and landed in Alexandroupolis. The soldiers denied involvement in the coup but said that they would not receive a fair trial in Turkey. Greece refused to extradite them without an appropriate court hearing, and an extradition trial in Greece requested by Turkey. The detention period expired after 18 months, without Turkey having requested a trial in Greece. In March, the Council of State – Greece’s highest administrative court – ruled that the first of the eight men should be freed from detention, although he is barred from leaving Greece and stays at a secret location with tight security, as his asylum application is ongoing. These rulings have continued, and on Tuesday the last four of the eight military servicemen were similarly freed. The dilemma for the Greek authorities was that if these people were sent back to Turkey … a fair trial is not guaranteed. And that was at a time [July, 2016] when the re-instatement of the death penalty was frequently discussed at many levels including [that of] President Erdogan. So it was impossible for the Greek justice system to send them back. It has nothing to do with their actual guilt or innocence, it was about the right to a fair trial [if] they were sent back to Turkey. The release of all the fugitive putschists cannot be explained as a routine administrative decision pertaining to their detention period. 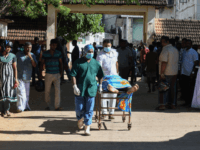 The release of the traitors who plotted a coup in order to overthrow democracy in a neighboring country by a country, which claims to be the cradle of the democracy conforms neither to international law, nor to good neighborly relations. Turkey retaliated in March by seizing two Greek soldiers, who had crossed the border from Greece into Turkey. The soldiers say they inadvertently strayed across the frontier in bad weather. 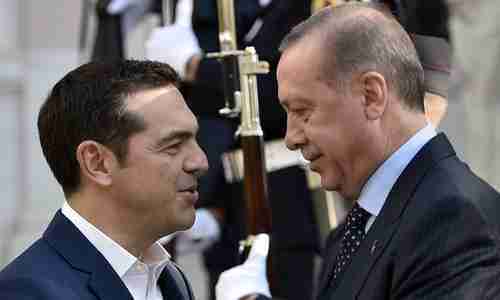 On December 7-8, 2017, Turkey’s President Recep Tayyip Erdogan paid a state visit to Greece’s Prime Minister Alexis Tsipras in Athens, the first official visit between heads of state since 1952. It appears that no issues were resolved at that meeting, least of all the fate of the Turkish soldiers being held in Greece. Wars between Greece and Turkey go back millennia, even celebrated in Greek mythology in the story of the Trojan Horse and the fall of Troy. In 1974, the countries fought a war over the island of Cyprus, with the result that the small island is split between a Greek portion and a Turkish portion. Cyprus unification talks are frequently scheduled, but with tensions growing between Greece and Turkey, they are unlikely to succeed. 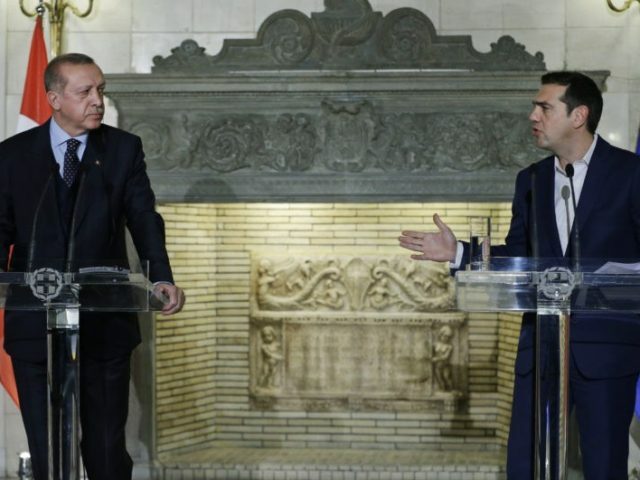 Besides the issues of Cyprus and the soldiers being held by each side, there has been a growing disagreement over the sovereignty of hundreds of islands in the Aegean Sea. The boundaries between Turkey and Greece, and the disposition of the islets in the Aegean Sea, were settled by the Treaty of Lausanne, signed by both countries on July 24, 1923. According to Erdogan, Turkey was deceived and cheated when it signed the Treaty of Lausanne, and he would like to renegotiate the treaty. Turkey has expressed the desire to renegotiate the treaty with a series of very belligerent military moves. In February a Turkish vessel rammed a Greek coastguard ship as both patrolled the waters off the Greek isle of Imia, causing extensive damage. Imia is one of the islands that Erdogan is disputing, claiming that it should have Turkish sovereignty. Tuesday’s flyovers by Turkish warplanes over the Aegean Sea are just the most recent of what are being characterized as “dogfights,” where almost on a daily basis Turkish warplanes violate Greek airspace, and the Turkish warplanes are intercepted by Greek warplanes on policing missions. Although deaths are uncommon, a Greek fighter jet crashed in April, killing the pilot.